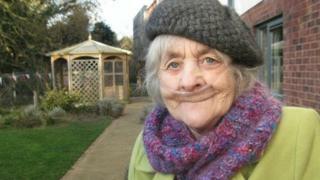 A woman died at home alone despite repeatedly calling the NHS 111 helpline for assistance, an inquest has heard. Anne Roome, 68, from Derby, died from bronchopneumonia and chronic obstructive pulmonary disease at her flat in June 2014. Derby Coroner's Court heard she had called the helpline 26 times but did not get the care she needed. DHU Health Care, which run the 111 service, has apologised to the family for its "failings". Louise Pinder, assistant coroner, concluded Ms Roome died of natural causes and was satisfied 111 had taken steps to improve its service. She said even if an ambulance had been sent, by the time of her last call, it probably would have been too late. Ms Roome was a frequent caller to the service and it was said this may have clouded the judgement of call handlers, who were "very distressed" by the outcome. Ms Roome made her first call at 18:35 BST on 16 June 2014 and her last at 05:41 the following day. She was found dead by her carer a few hours later. Her daughter, Rebekah Burgess, who flew over from New Zealand for the inquest, said: "Mum died alone in pain. "She deserved a hand to hold as she took her last breath." She said the simplest thing would have been to send an ambulance. Dr Aqib Bhatti, clinical director of 111, accepted there had been "clinical mismanagement" of the case and that correct procedures "weren't always followed". Stephen Bateman, chief executive officer for DHU, said: "We are deeply sorry to the family of Anne Roome for our failings. "We absolutely accept the findings of the coroner. "The standard of care was well below the standard we expect... it is clear that we didn't do enough for Anne."